Tour | I Review Too . 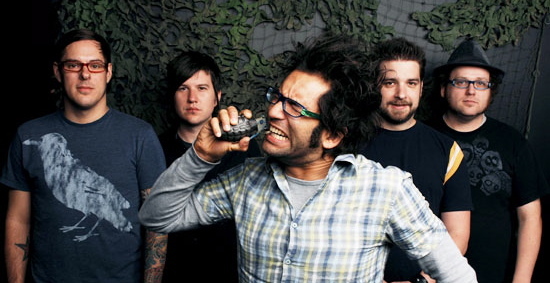 . .
Motion City Soundtrack are currently enjoying a short break before returning to their colossal Dino Initiative Tour, picking up again in Duluth, back in their home state of Minnesota on April 6th. During their brief trip to the UK Ireviewtoo caught up with the band to discuss the tour, the new album and preparation for an unusual set list with drummer Tony Thaxton. Posted in Features, Interviews, Tour and tagged Blink 182, Commit This To Memory, Even If It Kills Me, Justin Pierre, Manchester, Mark Hoppus, Motion City Soundtrack, My Dinosaur Life, The Dino Initiative Tour, Tony Thaxton. Bookmark the permalink. Sitting down with Ska-punk rockers Reel Big Fish at the Manchester Academy date of their 2010 tour, it suddenly becomes hard to find the best starting point for our conversation. With a career spanning almost 20 years, the band has endured quite a lot, but through personal problems and numerous line up changes one thing has always remained the same: the fans. Posted in Features, Interviews, Tour and tagged 2010, Aaron Barrett, California, Grant Barry, Interview, Jonny Christmas, Manchester Academy, Punk Rock, Reel Big Fish, Scott Klopfenstein, Ska, UK tour. Bookmark the permalink.